It's time for a brand new challenge at Really Reasonable Ribbon, and this time our theme is Add A Bow. 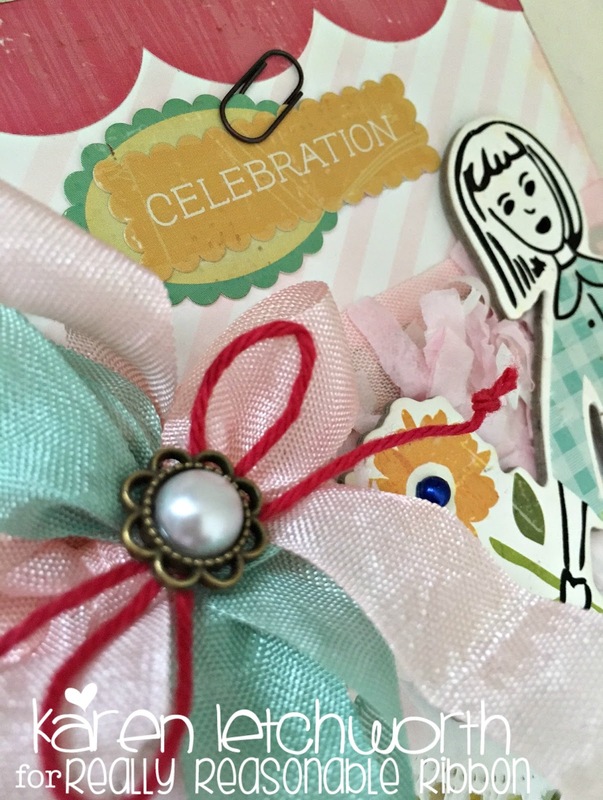 Personally, I think adding a bow using ribbon or trim of any kind is always the perfect touch for any card or project. Really Reasonable Ribbon carries SO many great trims to help you get started. So, pull out your ribbons and join us! I created my card using some Pretty Party products from Crate Paper including patterned papers, border stickers, chipboard, and sentiment stickers. I also added some paper fringe, a doily, a mini rusty paper clip, some mini accent pearl stickers, and then.....MY BOW! My bow includes a length of Bay Leaf Seam Binding, Baby Pink Seam Binding and Solid Red Baker's Twine. I topped that with a Flower Shaped Acrylic Rhinestone from our fabulous Embellishments section. If you look closely at the photo above, you can see how that Bay Leaf Seam Binding perfectly matches the color on the chipboard girl's coat, and how the Baby Pink Seam Binding perfectly matches the fringe. You see, Really Reasonable Ribbon carries SO many colors of everything that you're always SURE to find the perfect match for ALL your projects! If you need some ribbons to get started, be sure to stop by Really Reasonable Ribbon and treat yourself to some new trims and Embellishments. 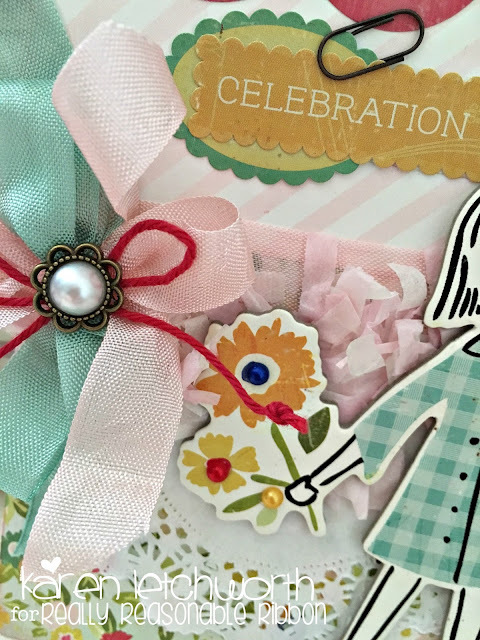 Then, pop on over to the Really Reasonable Ribbon Blog to play along in our Add A Bow Challenge. We look forward to seeing what you will create! 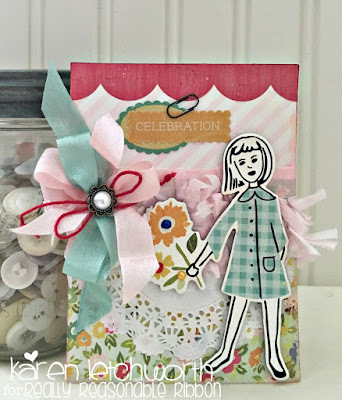 Simon Says Stamp Wednesday Challenge - Simon Says "Showers and/or Flowers" - My little girl is wearing her Spring rain coat and holding flowers (also floral patterned paper at bottom). 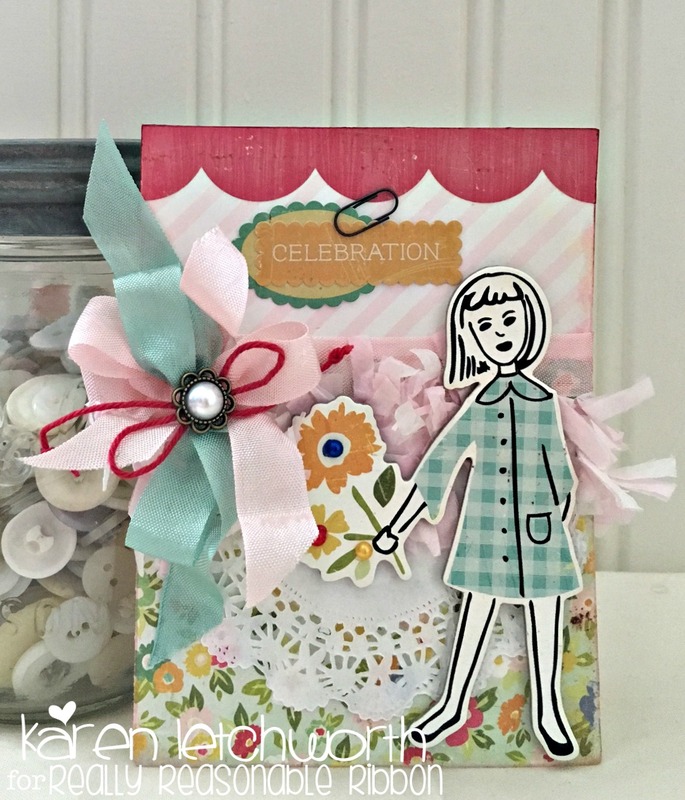 As You Like It Challenge Blog - Favorite Colors and Why - I love to use pink and teal together. There's just something about this color combination that really appeals to me, and I tend to use them together quite a bit. Beautiful! I love your gorgeous bow! !Congrats on your win over at Cardztv! Woohoo! Gorgeous card Karen! The image is so sweet & the whole design is lovely. I love your bows. So creative. I have issues with making them and I have piles of ribbons. I need to study your creations. Your card is so pretty. love all of the elements and colors. Beautiful work.